Welcome to the Digiteal technical reference documentation. Get in touch with our support department. Do you want a global overview of Digiteal ? Companies that want to integrate with the Digiteal services in order to send out their bills to their Digiteal clients. These companies use a custom software solution to send out their bills. Integrators, software companies, ERP, that are willing to provide a plugin for their clients to allow them sending out bills through Digiteal, avoiding hazardous customization. issue invoices that will contain the Scan2Pay QR code and for those invoices to be visible in the Digiteal web portal and mobile application. 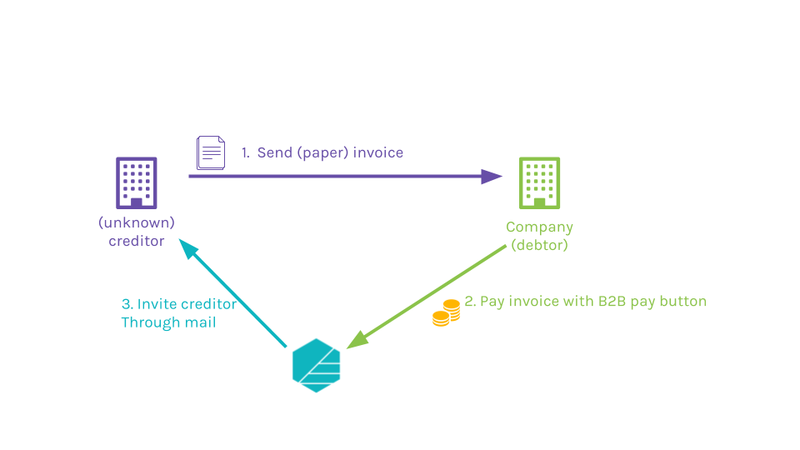 upload a invoice document which is linked to a previously generated invoice. Issuer : the company that is emitting the invoice. Requester : the company which is requesting a payment. Integrator: the company acting as an integrator for other companies who want to request a payment. All services provided by digiteal are exposed as REST services and use JSON as interchange format. All services implemented by the requester should be exposed as REST services and use JSON as interchange format. All services will be provided over a secure HTTP connection. Strong authentication solutions such as 2-way SSL are also supported. Contact technical support to register your public certificate if this is your prefered authentication method. When something happens, the Digiteal platform will notify the requester and/or integrator through webhooks. This means that Digiteal will call your service with a well defined JSON payload. You will be able to do whatever you need with this message. If the system of the requester/integrator is not available or responded with something else than a HTTP_OK, the Digiteal platform will retry later every hour until the message is successfully processed. If your system is failing too long or too often, we will inform you. If it continues to misbehave and with one week prior notice, we could remove your webhook. To register webhooks you can either have a single service that receives all the notifications or you could register a specific webhook per notification type. It's up to you. Please get in touch with the Digiteal support team to arrange this with us. As a requestor, you will received the notifications for the webhooks you registered to and that concern your company. As an integrator, you will receive the notification for all the companies that defined you as integrator. If you want to make use of the Digiteal services you need to register your free account on the Digiteal platform. With this account you will be able to generate invoices and upload invoice documents. The clients that chose to use the Digiteal platform to receive your bills will be notified, have the possibility to view the invoices and pay them. If you want to integrate our payment solution in your application please contact our sales for anything related to conditions and dev support for anything related the technical integration of our solution. 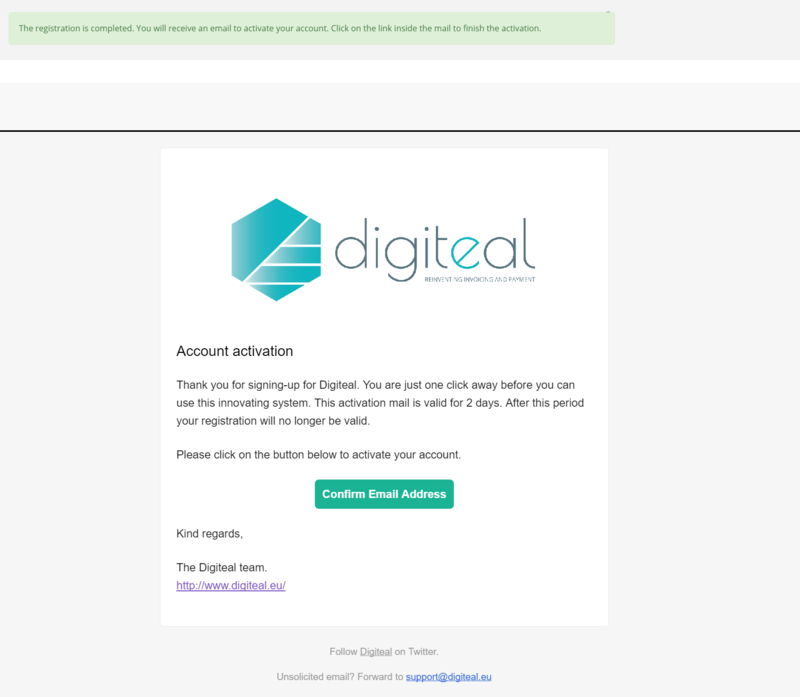 As soon as you hit the “Sign up” button, Digiteal will send an email to the email address you provided. This allows us to verify if this address is correct and related to you. Click on the confirmation link to complete this process. This e-mail address will act as login for the Digiteal platform and the web services. On your right you see a screenshot with the confirmation after submitting the registration and the confirmation mail. Once these steps are completed the Digiteal Team will validate your profile details. You will be notified by email once your account has been activated or be provided with the reasons why it can’t be activated. When your account is validated by the Digiteal team you will be able to send invoice metadata, upload the matching original documents and generate invoices. To simplify the on-boarding of your customers you can send them a link with some prefilled information. They will be redirected to our web platform and should only choose a password to finish the first step of the registration. Company webhooks will send you CompanyNotification as JSON payload. CREATED: A company has been created. VALIDATED: A company has been validated. UPDATED: A company has been updated. PUT_ON_HOLD: A company has been put on hold. CHANGED_INTEGRATOR: A company has changed integrator. CHANGED_TRUSTED_PAYMENT_INTEGRATOR: A company has changed trusted payment integrator. 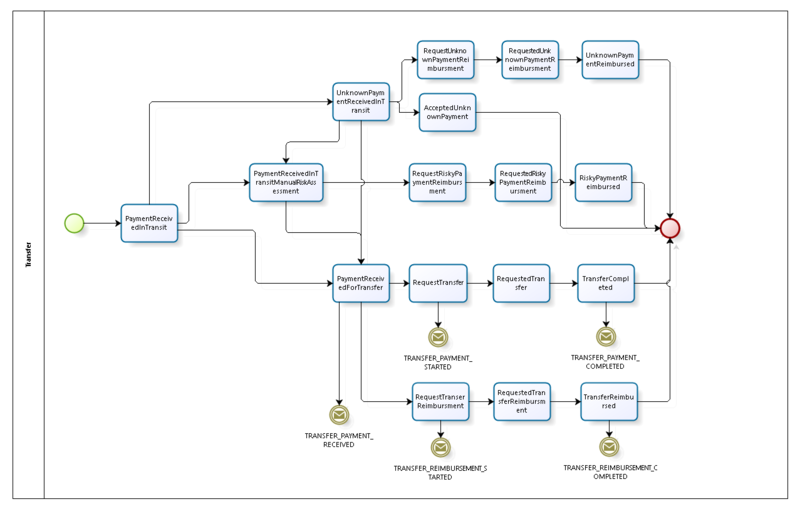 On your right you see a schematical overview of the process for creating and paying an e-invoice using Digiteal. In this overview the focus is mainly on the creation. The payment is discussed more indepth in the handling a Payment section. Here it is mentioned as a single step in the process. The output of the service will contain a payment image, the identifier of the invoice in Digiteal and the preferred delivery method of the client. If the client is already known and he/she prefers to receive his/her invoices in the Digiteal platform then a notification will be sent. If the client has indicated he uses the Digiteal platform to receive his mails you can upload your custom invoice document. This document will be stored and kept for 10 years. The client will be able to consult this document at anytime and on multiple supported platforms (web, mobile). If the client is unknown or hasn't indicated his preference you should use your other distribution modes to send the invoice containing the QR. Each invoice generation is logged to detect malpractice and prevent DOS attacks. API invoice details provides an overview of the provided services and gives a detailed description of the input and output parameters. When not specified the default value is PUBLISHED which allows no updates. The platform provides the possibility to introduce an invoice with a DRAFT status which can be updated later on. Users will not be notified for these invoices. When calling the service, the authentication parameters (username and password) have to be provided (HTTP Basic authentication mechanism). You do not have to specify any identifier related to your company in the input parameters. Based on the authentication parameters the Digiteal platform knows the company that sent the request. In case of 2-way ssl authentification, the identification will be done using the public certificate sent during the ssl handshake. For more information on how to register on the Digiteal platform please consult the Registration section. Upon registration, you will be authenticated by default using the username and password you chose. 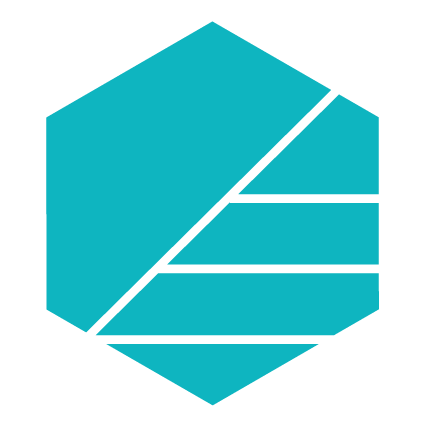 Important: The platform allows a company to define multiple bank accounts. Whenever a company has more than one confirmed bank accounts and no default is set in Digiteal), this parameter becomes mandatory. Otherwise our platform will not know on which bank account this invoice is supposed to be paid. Log on to the application, go to 'my profile' and select the bank account tab. If multiple bank accounts are registered then you are able to switch or define a default one by clicking on the “set as default button”. If there is only 1 bank account defined, it will be considered as the default one. If the internal client id is provided a customer will be stored in our system. Every new invoice request generated with this client id included will be linked. 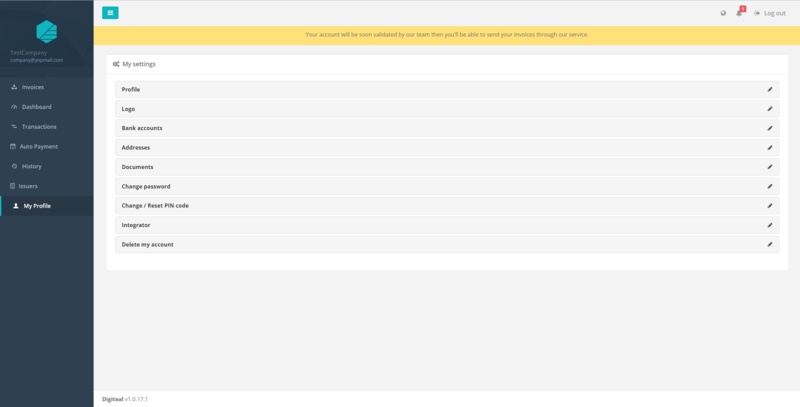 The end user will not be able to access the invoice on the Digiteal platform yet. In that case, Digiteal cannot be used to present the invoice yet. If the issuer calls the service later on using the same client id AND the email address the link will be created between the client id and email address thus allowing the end user to access his invoice. Providing the internal client id and the email address allows our system to notify the end user. The end user will be able to consult the invoice in Digiteal. Our system allows you to add your own internal identifier to the invoice. Later on, you can use your own internal identifier to link documents to the generated invoice. The amount is a required field. The only case where the amount is not mandatory is when generating a payment QR using the QR generator service. 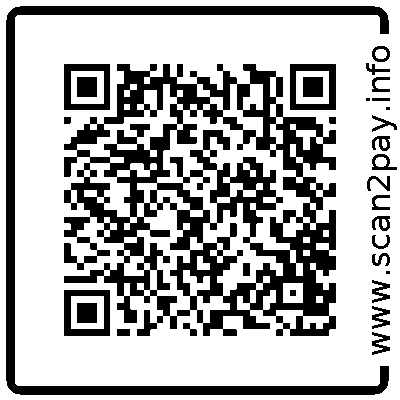 Generating a QR code without the amount allows people to fill in what they want to donate and still make use of the Scan2Pay method to prefill the other fields of the payment. the invoice is created. The response will contain the image in the body. The uuid, deliveryMethod and debtorId are present in the headers. provided information does not match any of your bank accounts in our system. typically when you forget to send us the BIC and IBAN and have more than one account. The system does not know the one that should be used. mandatory fields for the invoice request are missing. 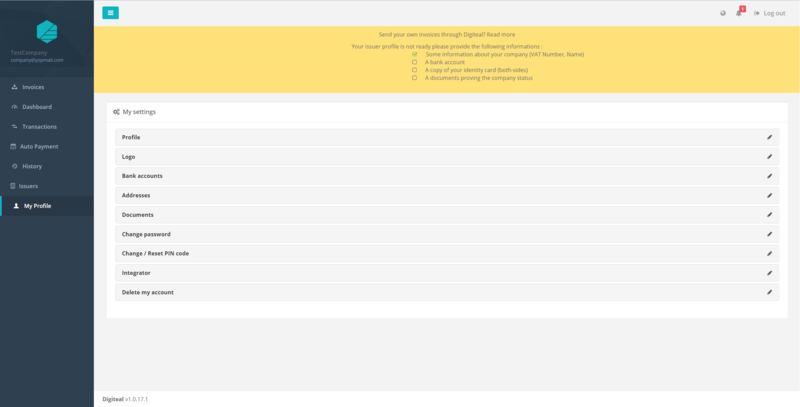 Invoices that are flagged as PUBLISHED cannot be updated. There was no input present in the request. is thrown when your profile is not yet activated or invalid. The service is called using an unsupported media type. Only JSON is supported when performing a POST. An internal server error occured. Contact support with information concerning your error (date, time, issuer) to know more about this particular issue. This service is used to attach a document (PDF, XML, RTF,...) to an invoice or a credit note. For example, this document can be a bill but it can also be some energy usage summary or the details of a telephone bill. This documents should only be attached if the customer choose to receive his invoice/credit note in Digiteal (aka he did an optin). You know that he did an optin by checking if deliveryMethod = S2P in the header of the response to the creation of the invoice / credit note. Multiple documents can be attached to one invoice/credit note. A document cannot be sent if it is not related to an existing invoice / credit note. Only the emitter of an invoice and his integrator can attach documents to it. There are two services to send a document. The first one uses the UUID of the invoice/credit note as returned when the invoice / credit note was sent and the second one relies on the issuer's internal identifier. An empty body response is sent. Additional headers are present (uuid of the document that you uploaded). Some input field is missing or wrong values were provided. The uploaded document has an unsupported media type. The service only accepts PDF files. This service is used to send a credit note linked to an invoice. For example, this credit note can be for 20 € out of a 100€ invoice. An empty body response is sent in case of success. Some input field is missing or wrong values were provided. The error message will describe which values are incorrect. There were no or incorrect credentials provided. Invoice webhooks will send you InvoiceNotification as JSON payload. PUBLISHED: An invoice been published. READ: An invoice has been read for the first time by the customer. PAID: An invoice has been paid. COMMENTED: A comment has been added to an invoice. UNPAID: An invoice that was paid is now not considered as paid anymore. DOCUMENT_ADDED: A document has been attached to an invoice. CREDIT_NOTE_PUBLISHED: A credit note has been published. CREDIT_NOTE_DOCUMENT_ADDED: A document has been attached to a credit note. Invoices API details provides an overview of the provided e-invoicing services and gives a detailed description of the input and output parameters. The Digiteal platform not only allows the end user (your clients) to pay their invoices, it also allows you to integrate the interactive payment solution with your proprietary software. Our platform provides 2 parts necessary to create and complete an interactive payment flow. Besides the interactive payment (user input necessary to finalize the payment) our platform allows the end users to configure automatic payments (payments executed automatically upon receiving an invoice). In this documentation, this functionality is described as the autopayment service. You can try it out using Digiteal's interactive payment demo application. This demo is linked to Digiteal's test environment so no actual payments will take place there. This service will be called by the Digiteal platform to notify the requester that we received a confirmation to execute a payment request. The unique payment id generated during the payment request creation will be provided as input. This allows the requester’s system to link the corresponding payment request on his side. If the service of the requester is unreachable the digiteal platform will retry later on. Payment webhooks will send you TransferOfFundsNotification as JSON payload. REIMBURSMENT_FROM_DIGITEAL: a reimbursement has been requested by the client. The money was still in transit and it has not been transferred to the creditor yet. The Digiteal platform reimbursed the client. REIMBURSMENT_FROM_REQUESTOR: a reimbursement has been requested by the debtor. The money has already been transferred to the creditor. The Digiteal platform will withdraw the amount from the creditor’s account. The Payment Requester API contains a method notificationTransferOfFunds that can be implemented to receive all those push messages. The main goal of the pay button is to provide an easy to integrate payment solutions that allows your users to pay by simply clicking on the button. The user will be redirected to a page on which he can choose how to pay. Using the digiteal platform (using his digiteal account) or scan a QR using the digiteal mobile app. You can use this solution by simply adding some basic html to your email template or web platform. It's important for us to keep the integration easy, fast, robust and most certainly secure. The pay button itself is context aware which means that the appearance will change if the payment is already executed. If you send your client an email containing the pay button and the client finalises the payment by clicking on the pay button, the next time he opens the mail the pay button will indicated that the payment has been fullfilled. We also provide you the possibility to define your own webhook that will be called whenever the payment has been validated by the client. the VAT number of your company for which you want to initiate a payment. The iban where our system will transfer the money to. (only required if invoiceUUID is not used) Our system performs a validation to see if the iban is linked to your account. Defines the language in which the button has to be generated, supported values are NL,FR,EN. Default value is EN. Unavailable page : something went wrong during the processing and an unavailability page is shown. The iban where our system will transfer the money to. If none is specified the default one specified on your profile page will be used. Our system performs a validation to see if the iban is linked to your account. The amount of the payment expressed in cents without comma. The B2B Creditor button allows the debtor to pay a creditor company using the same simple solution as the payment button. 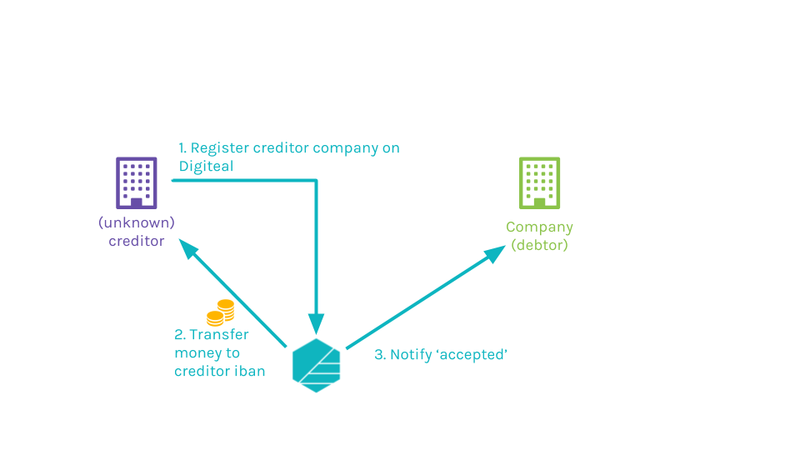 This solution allows you to pay a specific creditor even if the creditor company is not registered in Digiteal yet. When an invoice is received, the creditor button can be built using the metadata of the invoice. The money is transferred to the Digiteal Account. Pay the amount for the received invoice by clicking on the b2b creditor button. Once the payment has been confirmed by the pincode, the creditor company will be contacted through mail. The b2b creditor button applies the same interaction as the pay button and indicates that the invoice is paid but remains unconfirmed. The amount received by Digiteal will be kept on the account of Digiteal. When the company registers on Digiteal and activates his bank account (=validating that he is the owner of the creditor bank account), the money will be transferred. When the money is sent out, the debtor company will receive a notification and the button will also change appearance. If the creditor company does not register within 5 business days, the money will be reimbursed to the debtor. the VAT number of the creditor company you want to pay. Provide the company name of the creditor company. 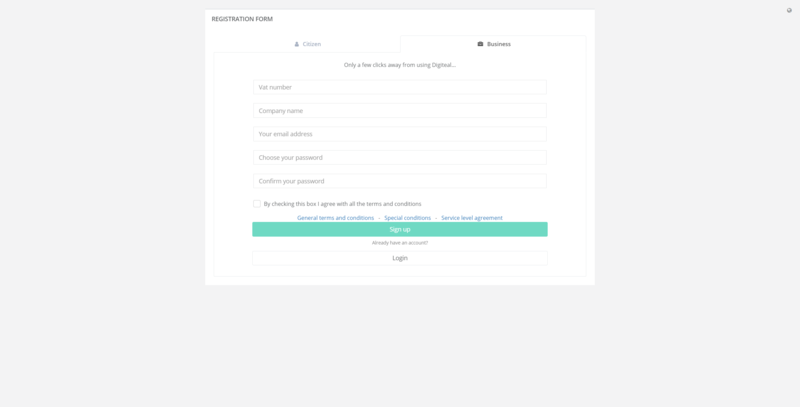 This name will be automatically filled in when the company goes to the registration page. The creditor iban that is present on the invoice. the email address of the creditor. calling this url will result in a redirect to the Digiteal payment platform. The Digiteal Platform allows a user to setup an auto payment configuration for his payment requests for a specific requester. By creating an auto payment configuration, the user allows the requester to automatically launch the payment request on the Digiteal platform. As a requestor, you can submit a payment request to the AutoPay service to get paid automatically (with no mandatory user intervention). The 'name of the missing field' is provided in the error message. This service only accepts POST. Not allowed to perform this action. As soon as an auto-payment configuration changed, the Digiteal platform will notify the requester and/or integrator through webhooks. For the autopay configuration changes, an AutoPayConfiguration will be sent in a JSON payload. CREATE: The autopay configuration has been created and it is active. UPDATE: The autopay configuration has been updated. SUSPEND: The autopay configuration has been suspended. This means it is not active for the moment. ACTIVATE: The previously suspended autopay configuration has been re-activated. CANCEL: The autopay configuration has been deleted. The Payment Requester API contains a method notificationConfigChange that can be implemented to receive all those push messages. Payment API details provides an overview of the provided services and gives a detailed description of the input and output parameters. Payment Requester API provides an overview of the services that you need to implement in order to support interactive payments. This documentation contains a detailed descriptions of the input and output parameters. When something happens, the Digiteal platform will notify the requester and/or integrator through webhooks. This means that Digiteal will call your service with a well defined JSON payload. You will be able to do whatever you need with this message. You are requested to answer within 20 seconds maximum. After 20 seconds, we will timeout and consider that the delivery failed. amount: If the total amount of the payments linked to this transfer has reached the maximum amount associated with the transfer, it will be transferred directly. Three days after the end of the transfer expiry, if the minimal amount of the transfer has been reached, it will also be transferred. third party confirmation: The trusted third party that created the transfer can validate or invalidate it. If it has been validated, the transfer will be executed immediately. If it has been validated, the transfer will be reimbursed immediately. Creation: The trusted payment integrator creates the transfer either through a call to the API or using the Digiteal platform UI. The parameters of the payment are the release condition, the minimum and maximum amount of the transfer, the end date, the creditor and his account. The creditor but have set the integrator as trusted payment integrator. The outcome of this creation step is a configured trusted payment with a defined creditor reference. Incoming payment(s): The integrator communicates the creditor references and requests the debtor(s) to transfer the money to the Digiteal trusted account (BIC: GKCCBEBB, IBAN: BE40 0689 0629 4063) using a usual bank transfer (SEPA Credit Transfer or SCT) with the provided creditor reference. Validation: The condition to execute the payment is met either by a call to the API for the paymens requiring a third party confirmation or if the maximum amount is met. Another condition to executing the payment is if the minimum amount is reached at the latest 3 days after the end of the payment end date. Payment: The payment is executed through a SEPA Credit Transfer (SCT) from Digiteal's trusted account to the creditor. When something happens linked to a trusted payment, the Digiteal platform will notify the debtor, the creditor and/or the integrator through webhooks. This means that Digiteal will call your service with a well defined JSON payload. You will be able to do whatever you need with this message. If the system of the debtor/creditor/integrator is not available or responded with something else than a HTTP_OK, the Digiteal platform will retry later every hour until the message is successfully processed. If your system is failing too long or too often, we will inform you. If it continues to misbehave and with one week prior notice, we could remove your webhook. As a debtor/creditor, you will received the notifications for the webhooks you registered too and that concern your company. As a trusted payment integrator, you will receive the notification for all the companies that defined you as trusted payment integrator. Trusted payment webhooks will send you TransferOfFundsNotification as JSON payload. TRANSFER_PAYMENT_RECEIVED: A payment has been received for a trusted payment. TRANSFER_PAYMENT_STARTED: A trusted payment execution has started. The money transfer order to the creditor will soon be executed. TRANSFER_PAYMENT_COMPLETED: A trusted payment execution has completed. The money has arrived on the account of the creditor. TRANSFER_REIMBURSMENT_STARTED: A trusted payment reimbursement has started. The money transfer order to the debtor will soon be executed. TRANSFER_REIMBURSEMENT_COMPLETED: A trusted payment reimbursement has completed. The money has arrived on the account of the debtor. Trusted payment API details provides an overview of the provided trusted payment services and gives a detailed description of the input and output parameters.